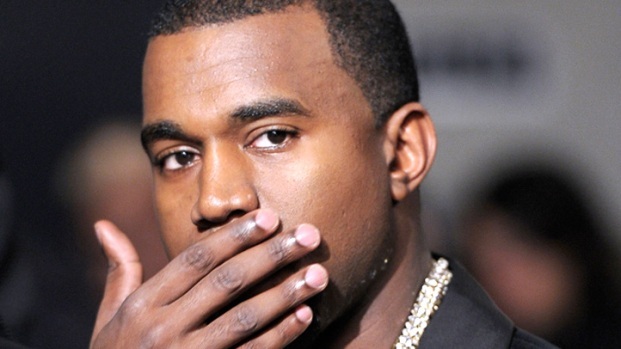 Kanye West won best male hip-hop artist but wasn't there to accept his award. Chris Brown accepting an award at the show. Amid awards for the top artists, actors and athletes, Steve Harvey was recognized for his humanitarian work at Sunday's BET Awards. BET Chairman and Chief Executive Debra Lee called the 54-year-old entertainer "a true gentleman who acts like a comedian but thinks like a citizen of the world" as she presented him with the Humanitarian Award. Harvey thanked God and his fellow philanthropists as he accepted the honor. Chris Brown won a pair of prizes early in the show. The 21-year-old singer and the night's leading nominee won best male R&B artist and best collaboration for his song "Look At Me Now" with Lil Wayne and Busta Rhymes. Brown accepted the collaboration award after performing a medley that including the winning track. "Public-speaking is not my strong suit," he said, thanking BET and his fans before passing the microphone to Wayne, who expressed gratitude to Brown for including him on the track. Busta Rhymes rapped his acceptance. Earlier in the ceremony, Brown also thanked his fans and the network: "I appreciate all the support. I know it's been a long road, so I appreciate every blessing in front of me." Kanye West-isms: Proclaims Himself the Next "Steve Jobs"
Lil Wayne also came on stage when Nicki Minaj accepted her award for best female hip-hop artist. "I can't believe for the first time I get to share a moment like this with the person who saw me rapping on a staircase," she said of the rapper and producer, who was incarcerated when she won the same prize last year. "Lil Wayne, I love you." Minaj was joined by Justin Bieber to present the male hip-hop artist award later in the show. Kanye West won but wasn't on hand to accept the trophy. Instead of traditional awards-show winners' envelopes, winners were revealed on a tablet device provided by Sprint. Diddy Dirty Money was named best group. Jaden Smith and Willow Smith were also early winners. The son and daughter of Will Smith and Jada Pinkett Smith tied as winners of the Young Stars award. But the show was really about the performances, which were plentiful. Mary J. Blige opened the ceremony at the Shrine Auditorium, performing her hits "All Night Long" and "Real Love" before being joined by Anita Baker. The divas performed a duet of "Caught Up in the Rapture." Rick Ross, Lil Wayne, DJ Khaled and Ace Hood shared the stage for "Hustle Hard." Alicia Keys unveiled a new song, before lapsing into "A Woman's Worth," for which she was joined by Bruno Mars, and her breakthrough hit, "Fallin'." Jill Scott sang in a speakeasy setting. Trey Songz took off his shirt during his performance, even after host Kevin Hart said the young singer looks "like a beige greyhound" shirtless. Donnie McClurkin kicked off a gospel celebration, with Mary Mary and Deitrick Haddon joining in to sing "Thank You." Beyonce was still to perform and Patti LaBelle was to receive the Lifetime Achievement Award.